It takes place on a beach, with scraggy grasses and a path winding up through the large, hilly dunes. The sand reflects back light, suggesting the open expanses along a vivid sea. Only above is not a blue dome of sky, but rather the black cavernous upper reaches of the stage, with bright white spots hung in regular patterns on the lighting grid. The effect is surreal and perfectly in keeping with Edward Albee’s 1975 Pulitzer Prize–winning play, Seascape. The production is the first under the direction of A.C.T.’s new artistic director, Pam MacKinnon, and it’s an indication of her skill and taste. The Tony Award–winning director was a close collaborator with Albee, and this is the 11th production she has directed of his work. It’s a stylish production, with flawless directing and equally fine acting. 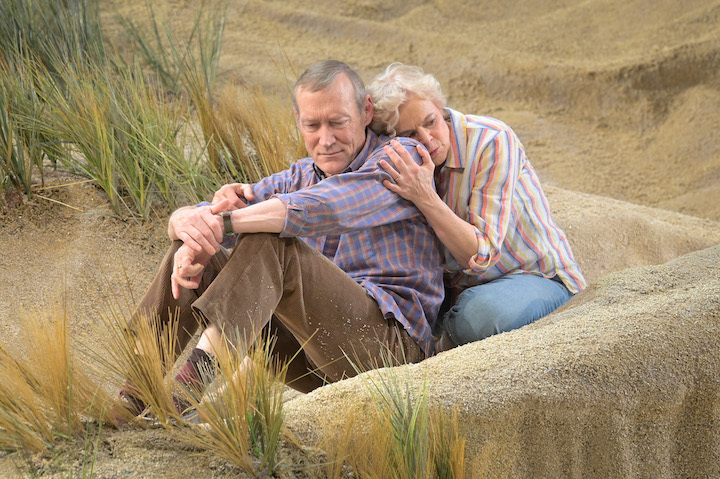 Retired married couple Nancy (Ellen McLaughlin) and Charlie (James Carpenter) look back on their marriage in Edward Albee’s “Seascape”. Photo by Kevin Berne. Nancy (Ellen McLaughlin) and Charlie (the ubiquitous James Carpenter) are a long-time married couple now faced with the open expanses of time that mark retirement. What to do now? is the current pressing question of their lives and their life together. Nancy wants to spend their time together chasing the sun in beach after global beach. But Charlie wants to rest. Their discussion slides into mild bickering. Eventually, they share secrets. Nancy’s: that early in their marriage she had thought of leaving him because his remoteness made her think he was unfaithful. Charlie’s: that he had loved the world under water so much as a child that he would submerge himself to drift there for as long as he could, whether in a pool or in the sea. These two confessions are presented as long monologues that seem to come out of nowhere and require the players to be convincingly conversational while revealing moments of deep passion and isolation. That they were negotiated so well by the actors and director was a credit to all. Into this ongoing scene of mild marital discontents intrude Sarah (Sarah Nina Hayon) and Leslie (Sean Gallagher), another married couple. Funny thing though, Sarah and Leslie are giant lizards. And here I must give a second bravo to David Zinn, who designed both the scenery and the costumes. The lizard costumes are brilliant, wonderfully padded and scaled to reptilian correctness and enhanced by green, yellow and gold face makeup. 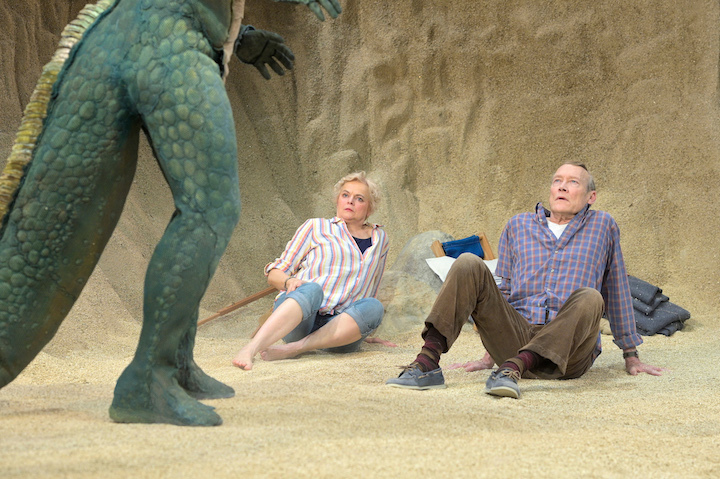 Nancy (Ellen McLaughlin) and Charlie (James Carpenter) are greeted by Leslie (Seann Gallagher), a human-sized lizard. Photo by Kevin Berne. Sarah and Leslie are a couple of misfits, who feeling alienated and isolated in their fishy world have decided to try the upper world of dry land. There are passing noises made about evolution in parts of the script, but as an evolutionary scientist Albee made a good absurdist playwright. What was least comfortable about this wonderfully realized play was Albee’s script. It’s odd how we can watch plays that are 200 or 300 years old and easily accept the terms of their history, but a play that is 40-50 years old seems somehow dated in its conventions. In Seascape both couples seem hopelessly bound to gender definitions that are no longer cutting edge, or even bluntly edged, in our culture in which identity has become deeply politicized. Nancy and Charlie, Sarah and Leslie follow the conventions of 1950 America’s idea of marital correctness. Nancy and Sarah are more compassionate even while pushing (gently nagging) their reluctant but resigned men along, and Charlie and Leslie are defensive, competitive and sexually protective of their women. Fidelity and monogamy seem to be the only definition of love, with men seeing their role as fulfilling the needs and expectations of their rather naive wives and their wives hungry for something more exciting and fulfilling. It’s a world that many groups have worked hard to move past in the last 40 years. And it’s a world that Albee, rightly, portrays as tedious and narrow. Oddly, however, Albee has both couples accept their roles finally, placing the human couple in the role of mentoring the lizards, who have no conscious understanding of emotions even as they are capable of experiencing those emotions. Sorrow, fear, sadness, love – is this what makes humanity worthy of life? Albee seems to be posing that possibility. It’s up to you, the audience, to decide. Seascape continues at A.C.T.’s Geary Theater through February 17. For tickets and information, visit act-sf.org.